Don’t let your gingerbread men leave home naked.. There must be, or should be, a rule that all gingerbread men need red buttons to be suitably dressed for holiday functions. 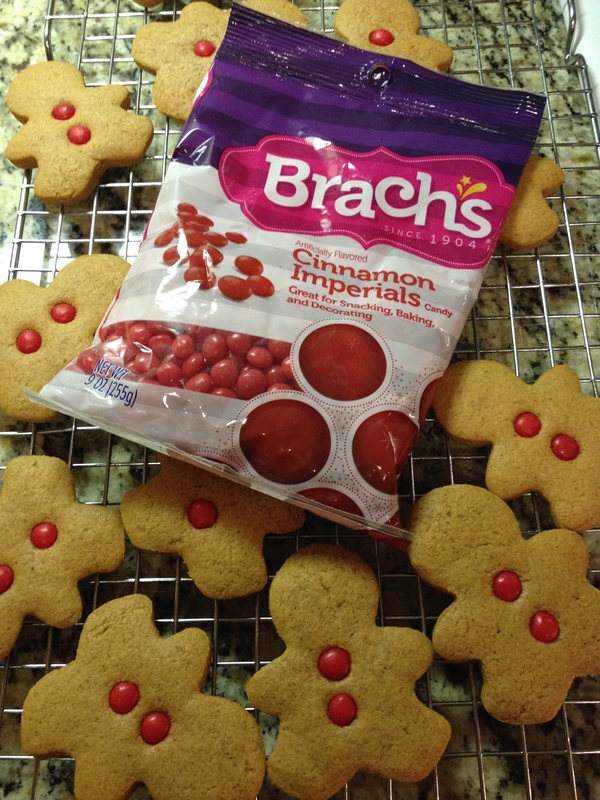 The perfect red buttons are Brach’s Cinnamon Imperials. They get just a bit chewy after baking and have the perfect little hot taste to compliment the ginger cookie. Pick up a bag or two before you start your holiday cookie baking frenzy. Posted in baking, Christmas, Cinnamon, Cookies and tagged Cinnamon Imperials, gingerbread men, holiday baking, holiday candies. Bookmark the permalink. Way too cute. I was told that red m&m’s work really well too. They don’t melt apparently.